Uniformed Recruiting Sergeants at Westminster. 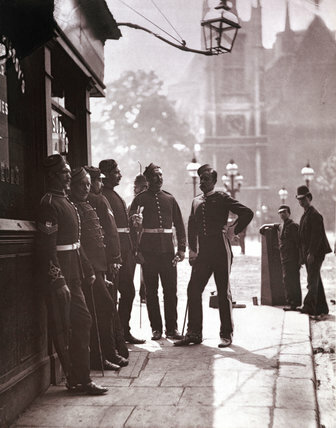 The image is taken from a series of 37 photographs published in the book, 'Street Life in London' (1877), with text written by John Thomson and the journalist Adolphe Smith. After taking photographs in the Far East, Thomson opened a portrait studio in London in 1875. Two years later he collaborated with the journalist, Adolphe Smith, to produce 'Street Life in London'. The book was conceived as a follow-up to Henry Mayhew's famous study, 'London Labour and the London Poor' (1861–2). The photographs were used to guarantee the book's authenticity.